State Bank of India, the banker to every Indian, also known to be the largest banking and financial services company in India by assets (2014-15) is trying hard to be the “Banker to Digital India.” The desperate attempt to stitch in the PM Modi’s vision of Digital India. In order to do so the bank recently ran full page print ads in leading news dailies of the country. 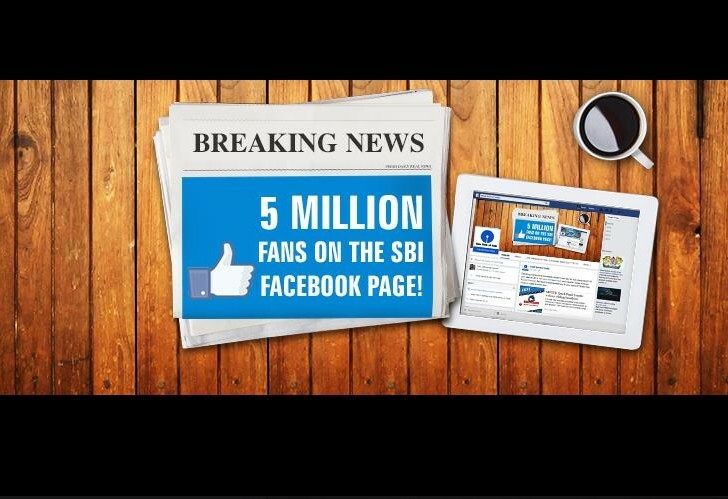 The objective was to celebrate a major milestone – celebration of “5 million followers” that the bank had secured on its Facebook page. The ad was picked up on social media; a majority had ridiculed the way the bank wasted money in these print ads. Many found these ads meaningless as celebration of Facebook fans is no more a big deal in 2016. A couple of years ago Lighthouse Insights (LI) used to receive press releases requesting to cover stories on such Facebook and Twitter milestones. However it is quite rare to find brands burning good amount money on print to celebrate digital numbers. At least in 2016 it is quite rare and bizarre. Besides why would you do such an activity when SBI, India’s biggest lender reported a 62 percent drop in Q3 profit on account of rising bad loans. LI had approached SBI to get thoughts on their objective for running such print ads. The request was not accepted as the PR thought it wasn’t worthwhile for the marketing manager to respond to. In fact the PR wasn’t even aware of the social media backlash regarding the print ad by SBI. Looks like online reputation management team springs into action when the house is already on fire! For a common man SBI is synonymous to a bank, like Facebook is to a social network. At a time when the social media population is yet to touch double digits in the country, most people have no clue what ‘Facebook Likes’ are, forget readers questioning fan acquisition methods and what percentage of them are “fake likes” coming from distant lands. 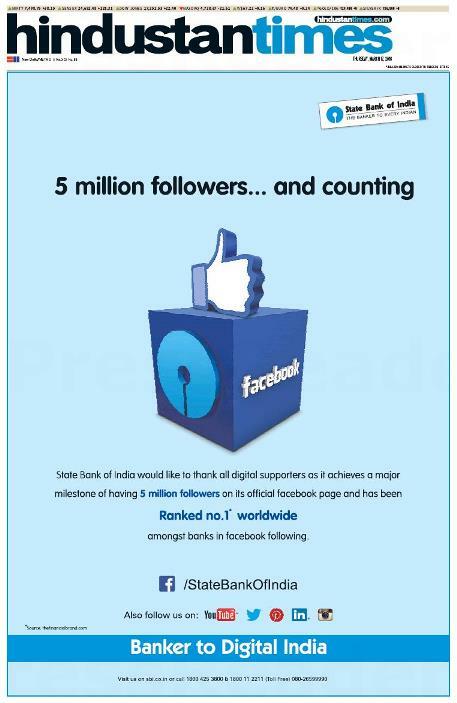 As the target audience is the common man, the ad copy coolly says 5 million followers and not ‘likes’. In addition to this the focus is on the number ‘5 million’, ‘ranked no. 1 worldwide’ and ‘banker to digital India.’ All of them are enough to catch eye balls and fill the reader with pride even if she isn’t a customer. This is not about wastage of money because the idea was to go chest-thumping on print. These can be argued but with this ad SBI wants to communicate with an audience that believes social media is Facebook. Early last year we had written about how Indian banks have evolved on social media. From playing Facebook and Twitter contests, banks are into social banking and interactive storytelling. For instance Kotak Mahindra Bank which has more than 636K fans only, launched Jifi Server – a social savings bank account which can be managed via Twitter and Facebook. Soon ICICI teamed up with Twitter India to launch #ICICIBankPay – a first-of-its kind service in India that enables ICICI Bank customers to transfer money to anyone in the country who has a Twitter account, check account balance, view last three transactions and recharge prepaid mobile in a completely secure manner. DBS Bank India from 2014 has focused on a digital storytelling route to build brand awareness. The second season of DBS Chilli Paneer included user interactivity wherein viewers became storytellers. In an age where so much digital innovations are happening to cater to the young generation, SBI is spending money on such activities which could have been a feat in 2012. I’m not sure if we are supposed to laugh at it. If you have spent 5 minutes with Facebook ads then you would know 18-24 age group yields the cheapest fan acquisition cost. The joke is on us guys, but then tomorrow if this is an ad copy on a print daily, the common man wouldn’t know this. SBI can continue to be ignorant, call itself a millennial bank or find a better digital agency. SBI needs to fire it's' agency. money 2b spent before 31/3?